After Frankie Edgar was granted an immediate rematch with UFC lightweight champ Benson Henderson, the rumor mill immediately started buzzing over Anthony Pettis’ (Pictured) future. Would “Showtime” be Zuffa, LLC’s first crossover fighter and challenge Strikeforce 155-pound champion Gilbert Melendez on May 19th? Or would Pettis remain in the major leagues and shed 10 pounds to confront UFC featherweight king Jose Aldo for his crown? With a simple tweet on Wednesday afternoon, the 25-year-old quickly killed all chatter by professing he’s not planning on relocating anywhere anytime soon. “I’m not dropping to 145 to fight aldo! 155 is my home and I’ll get that belt soon!! 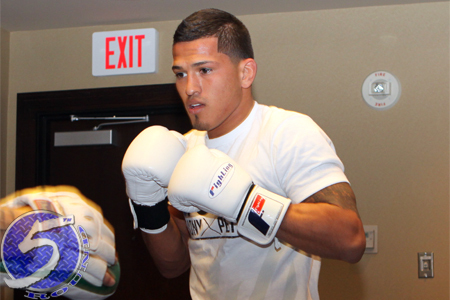 !” Pettis posted just moments ago. UFC president Dana White tentatively promised Pettis first dibs at Henderson’s strap after putting Joe Lauzon to sleep last month. However, after numerous conversations with Edgar, White decided to change course and arrange an instant sequel between “The Answer” and Henderson. No word on when Pettis will return to the Octagon.